We specialize in carrying authentic hand-gathered Native California White Sage for smudging rituals that cleanses the mind, body, chakra and spirit as well as other smudging herbs, shells and smudging feathers. 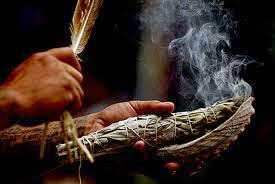 Smudging is a personal ritual as well as the prayers that we say. 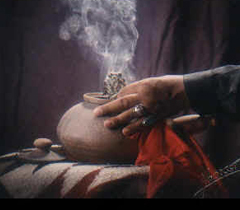 For smudging one generally will use an abalone shell or clay bowl to hold the sage. Matches made of wood from the earth, not a man made lighter. Much like a bonfire, sage needs air to burn .A sacred smudging feather from Mother Nature to send air and wind to the burning plant as well as the sage you would like to burn. Feel connected to your smudging feather and sage. Different tribes use different plants for their rituals and prayers. Juniper and cedar and sweet grass are very powerful for moving out negative energy in your life, home and surroundings. Then use California white sage, Desert, Sacred sage, Sacred Feather, Blue, Yerba Santa, Dakota Black, and Mugwort, Lavender and Rosemary are some of the popular smudge sages used to bring balance, peace and fresh energy to your life. Resins such as copal, amber and frankincense may also be added in to a smudge blend to be burned in the bowl. One may use a charcoal tablet to burn mixed herbs in a shell or one may choose to smudge with a smudging stick or wand. When smudging, light your sage and fan the sage with your feather as you move around a person or space. The smoke represents prayers going out in to the Universe. Speak your prayers or wants as you smudge. 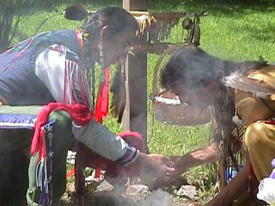 The medicine wheel is an important part of the smudging ritual. There are 4 points of the Medicine Wheel. North, South, East and West which stand for a Strong Spirit Animal Guardian- the White Buffalo, Coyote, Eagle and Grizzly Bear – all connected to the four elements- Earth, Water, Air and Fire. You can call on the energy of the 4 guardians when smudging, in these 4 patterns. Face or move around a person or surrounding from each direction, calling on the Spirit Animal and Element. North direction aligns with the Animal Spirit of White Buffalo. It is grounding, protective-gives knowledge of life and death. It also aligns with the Earth element. South direction aligns with the Coyote which represents clever, quick minded and governs the emotion and the Water element. East direction aligns with the Eagle which represents Inspirational, far- sighted, fiercely protective- clarifies. It aligns with the Air element. West direction aligns with the Grizzly Bear which represents energetic, strong, powerful, determined- cleanses and the Fire element. As you smudge you will cleanse the energy. The more you smudge the more clear your life will become and you will move forward. Smudging is a personal ritual and prayer which belongs to you. Face each 4 direction and embrace the meaning of the animal, element and attributes of choose your power direction. Cleansing you and your space is very powerful for your life and warrior spirit in connecting to life and earth. Smudging feathers are gifts from Mother Earth and the winged animals of nature. A smudging feather is an honorable possession and should be treated with respect. Bless and smudge it to honor it. Different species of birds, colors, added jewels and the honorary wrapping from another animals leather hide brings power to the owner and smudging ritual. 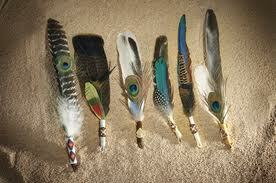 Our Native American artist Tom Ashley makes many of our feathers. He can make a special one for you. Just ask!